Summer is almost here which means lighter eating in my house. Now I have one kid who is a selective vegetarian and two who can't have gluten which makes dinner a freaking nightmare for me, the sole cook in the home. But there are few meals that all of my kids love but if it's Mexican food, it will be a hit. I could eat Mexican food everyday and never get sick of it. My kids started eating spicy Mexican food before the age of one, making them all mine! The only downside to my love of Mexican food is that it's traditionally fattening. Which is why I try to make some of my favorite Mexican meals meatless to lighten up the calories and fat. 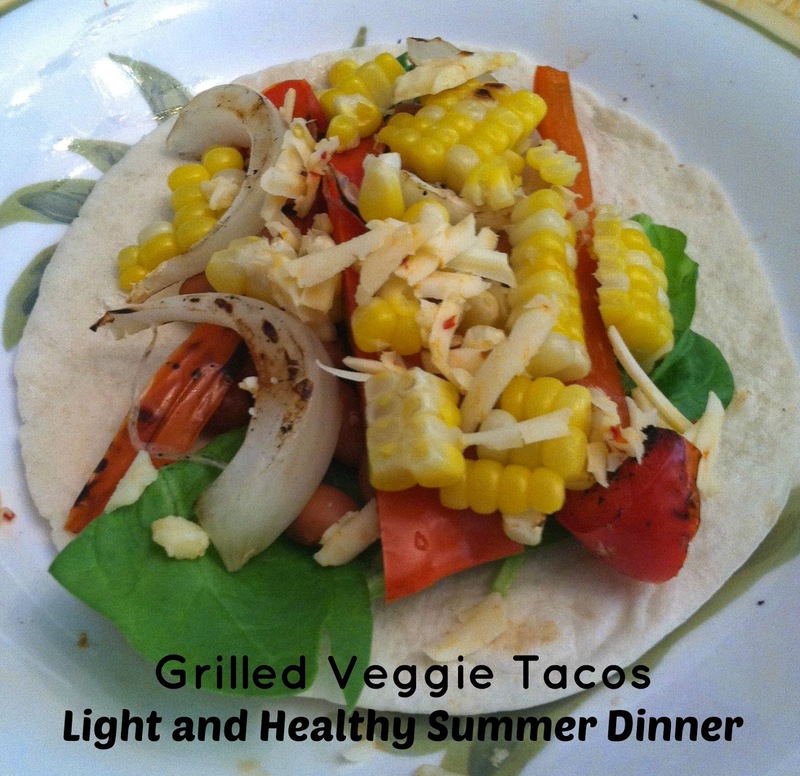 This meal not only is light in calories and fat but was a HUGE hit with my kids. Do you know how often I make a meal that all three of my kids like? Yeah, it happens almost as often as a solar eclipse. Fine, that's an exaggeration but it feels spot on. Oh and did I mention that this meal comes together with very little prep time and cooking time? I hope I have you hooked now! To streamline the process of this meal, throw the corn on the grill and then prep all the other ingredients. You will have dinner on the table in 30 minutes! Plus you won't heat up your home. 1. Preheat your grill to med/high heat. 2. Remove half the husk from the corn. Place on the grill and cook for 15-20 minutes depending on the heat of your grill. You want the corn to be soft to the touch. 3. Meanwhile spray your bell peppers and onion with olive oil and season with salt and pepper. This is when I absolutly love my Prepara Oil Mister ! I have no idea how I ever lived without it. 4. Grill bell pepper and onion for 5-7 minutes. Meanwhile, heat the beans in the microwave or on a grill pan. terrible picture but you get the point! 5. Remove bell pepper, onion, and corn from the grill. 6. Slice the onion and bell pepper halves. 7. Remove the husk from the corn and slice the corn off the cob. You want the corn to come off into big chunks. Once all the corn is off, season with salt and pepper. 8. Serve with flour and corn tortillas. I place all the ingredients in bowls so my kids can assemble the tacos to their liking. I've noticed they are more likely to eat my food when it's their choice to put it on their plates. These tacos are light and delicious! Plus between the beans and the corn they are full of protein which will keep you full without the fat and calories. Disclaimer - This post contains affiliate links.